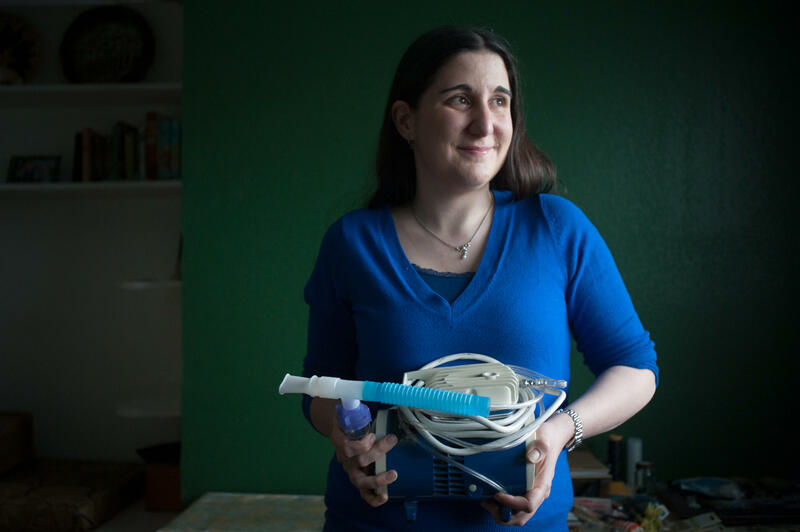 Virginia Rady, 28, holds her old nebulizer at her home in Dallas. Rady was diagnosed with chronic persistent asthma at age 2. She underwent a series of three outpatient surgeries between December 2012 and February 2013 for a procedure known as bronchial thermoplasty. She says the procedure has changed her life, allowing her to remove her nebulizer from her bedside. 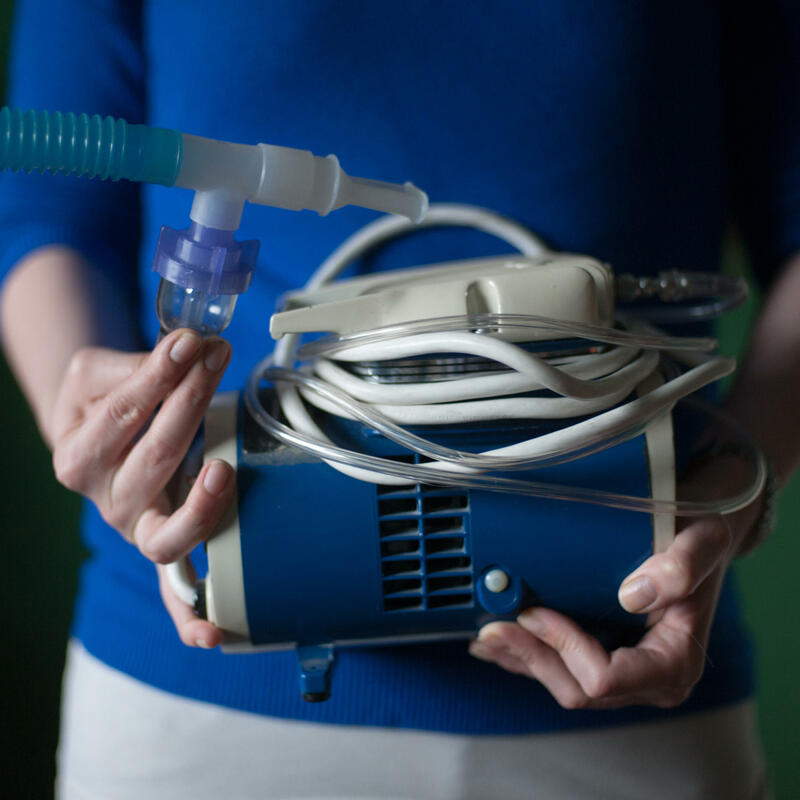 Virginia Rady no longer has to use this nebulizer to deliver asthma medication. She underwent a procedure known as bronchial thermoplasty, which has reduced her need for drugs to control symptoms. Rady, shown with her dog, says she's now able to exercise regularly, and hopes to be able to have children. If you've ever tried to drink something through one of those little red coffee stirrers instead of a full-sized straw, you know what it's like to breathe with asthma. Twenty-five million Americans have been diagnosed with asthma. And for 10 percent of them, medications like inhaled corticosteroids and long-acting beta agonists aren't enough to keep them out of the hospital. In 2010, the FDA approved bronchial thermoplasty, the first nonpharmaceutical treatment for severe asthma. People are starting to try it. Virginia Rady is one of them. Rady has had asthma since she was a toddler. She tried to go away for college, but after a bad flare-up first semester, she moved back home. She's now 28, but her lungs are like those of a 65–year-old. If something triggers her airways to twitch and close up, it could be deadly. That means avoiding everything from cats and dogs to exercise and stress. "If I were to get really emotional," says Rady, who lives outside Dallas with her husband, "I could actually trigger an asthma attack." Inhaled drugs and other medications offer temporary relief for most asthma patients. Bronchial thermoplasty, on the other hand, is intended to reduce asthma symptoms permanently. So when Rady heard that bronchial thermoplasty that might help her decrease the number of pills she takes, she was intrigued. The procedure attacks the problem at its very root — the muscles in the lungs' airways. During an asthma attack, muscle cells contract and restrict airflow. To keep the muscles from constricting, a catheter is used to deliver heated zaps of energy that essentially burn off the outer layer of smooth muscle cells. That way there's less muscle to contract. Studies of the procedure have not shown that it reduces airway hyperresponsiveness or the amount of air a person can exhale. But it does seem to improve people's quality of life. One study found that patients who underwent the procedure, which requires three sessions, saw the number of asthma attacks drop by a third, on average, and emergency room visits decline by 70 percent. They also lost far fewer days from work and school. The study was funded by Boston Scientific, the company that created bronchial thermoplasty and sells the machines. "We go into airways that are 3 millimeters or bigger," says Dr. Gary Weinstein, a pulmonologist at Texas Health Presbyterian. "And we're heating them up. It doesn't get that hot — about as hot as a cup of coffee." Weinstein has performed bronchial thermoplasty on more than two-dozen patients, including Rady. Studies haven't found major safety issues so far. But more research is needed to figure out which patients might benefit, how long the effect lasts and long-term safety. The biggest drawback to bronchial thermoplasty seems to be the immediate response to the treatment, which can temporarily make symptoms worse. "It's like shoving a stick at a hornets' nest," Rady says. "In the days afterwards, you're wheezing. It's not pleasant." But for Rady and other patients, when the symptoms caused by the treatment subside, it's life-changing. Rady has been waiting to have children until she can taper off her steroids. Now that she has decreased her medications and is able to go outside and exercise regularly, Rady says, she's building up the stamina to be a mother. "I'm up to 30 minutes on the elliptical and can walk a half-hour after," Rady says. "I can actually do all of that without the inhaler. And that to me is the awesome thing — not needing the drug." Bronchial thermoplasty isn't a magic wand. It doesn't cure severe asthma, and it can be costly — treatment can run into the tens of thousands of dollars. Many insurers don't cover it because they consider it an experimental treatment. But in 2012, Medicare agreed to pay for the catheters used in the treatment, and other insurers may follow. Rady did persuade her health insurance provider to cover the majority of the cost — she paid a total of $5,000 out of pocket — but says she was denied coverage at first. "I would think that anything they could do to keep me out of the hospital is worth it," Rady says. "One of my hospital bills in high school was $40,000. So in my opinion if you can get this and avoid just one hospitalization, it would more than pay for itself." The procedure may be part of a move toward tailoring treatment based on the type of asthma a person has, according to Dr. Gaetane Michaud, an associate professor at Yale School of Medicine who has been researching bronchial thermoplasty for more than a decade. "Bronchial thermoplasty certainly has its place," Michaud says. "I think we just need to understand more who it is right for." And now we turn to a relatively new treatment for asthma. Winter can be an especially difficult time for the millions of people who suffer from asthma. And for some of them the normal round of inhalers and medications is not enough. Lauren Silverman, of member station KERA, reports on a treatment that uses a heated metal device to widen the lungs' airways. LAUREN SILVERMAN, BYLINE: If you've ever tried to drink something through one of those little red coffee stirrers instead of a full-sized straw, you know what it's like to breathe with asthma. VIRGINIA RADY: You just can't get the air in. RADY: Cats, dogs, pollen, grass, dust, exercise, stress. If I were to get really emotional and start crying I could actually trigger an asthma attack. SILVERMAN: Rady tried to go away for college but after a bad flare-up, she moved back home. See, for people with severe asthma, an inhaler isn't always enough. Treating the disease can mean skipping school and work, hospital visits, expensive steroids and breathing machines. RADY: During a bad exacerbation, I actually will wake myself up. I'll set an alarm on my phone, take my treatment, go back to sleep and it's because if I don't, I'll wake up later not breathing. 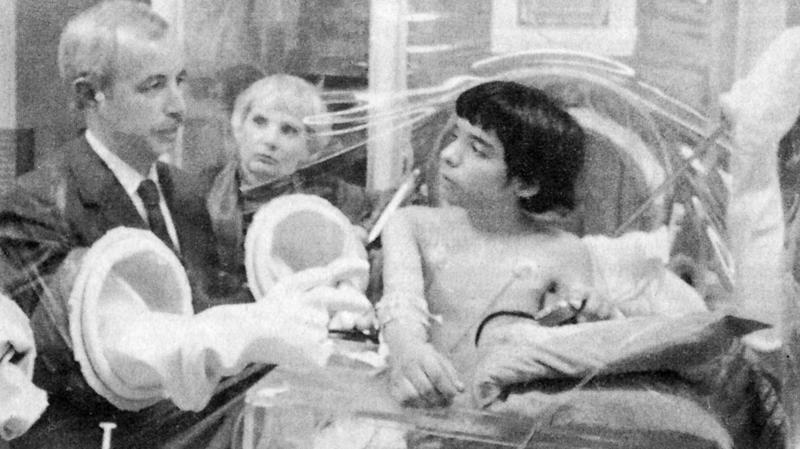 SILVERMAN: For decades, a big breathing machine and a face mask lived by Rady's bed. Since last February, they've both been gathering dust in her closet. That's when she had a procedure called bronchial thermoplasty, which involves putting a metal catheter into the lungs airways over and over again. DR. GARY WEINSTEIN: We go into airways that are three millimeters or bigger and we're heating them up, and it doesn't get that hot, it gets about as hot as a cup of coffee. SILVERMAN: Gary Weinstein is a pulmonologist at Texas Health Presbyterian in Dallas. He says an invasive treatment to widen the airways might sound like torture, but patients are sedated. WEINSTEIN: Most people have very little recall of the whole thing except coming into the room and doing a bit of coughing. SILVERMAN: He's done it on dozens of people, including Rady. And while inhaled drugs offer temporary relief, he says, bronchial thermoplasty attacks the problem at its root - the muscles in the lungs themselves. The procedure is done in three separate visits. Every time the catheter is inserted, it delivers heated zaps of energy that essentially burn off the outer layer of smooth muscle cells. Less smooth muscle means less seizing up. WEINSTEIN: This seems to be a very good therapy. We found a number of patients who have been stuck on oral prednisone who have gotten off. It seems to be a very helpful procedure that persists. SILVERMAN: Now, this procedure is really only for the 10 percent of asthmatics who can't control symptoms with medicine. For those patients, one five-year study, funded by the company that created bronchial thermoplasty, showed positive results. Patients reduced their hospital visits by 70 percent and saw their asthma attacks drop by a third. The biggest downside to the treatment is the body's initial reaction. RADY: It's like shoving a stick at a hornets nest. You're wheezing, it's not pleasant. SILVERMAN: But once this temporary asthma flare-up subsides, Virginia Rady says it's life-changing. SILVERMAN: Rady, who's a nurse, had been putting off pregnancy because she didn't want to be on steroids, which can cause thinning bones, mood-swings, even type II diabetes. Now, thanks to bronchial thermoplasty, she cut back on medications and is going outside to exercise. Rady is hoping to get pregnant because now she feels she has the stamina to be a mom. RADY: I can't imagine saying, Nick, the kids are yours now, I've got to do a breathing treatment and then a nap, and that's just the way it would have to be - but hopefully, now I can be kind of normal. SILVERMAN: Bronchial thermoplasty isn't a magic wand. Don't expect to throw out your inhaler. And while Rady's insurance helped pay the $20,000 bill, many insurers are still not covering the procedure. Doctors agree that's likely to change. DR. GAETANE MICHAUD: Bronchial thermoplasty, I believe, certainly has its place. I think we just need to understand a lot more about who it is right for. SILVERMAN: Yale's Dr. Gaetane Michaud has been researching bronchial thermoplasty for more than a decade. She says asthma treatment will eventually become more personalized. MICHAUD: We have anti-inflammatory options, we have bronchial thermoplasty options, we're starting to develop additional add-on therapies and we just need to figure out which one will work with which patient profile. SILVERMAN: Now that doctors have another weapon to fight asthma, she says, they just have to settle on when to use it. 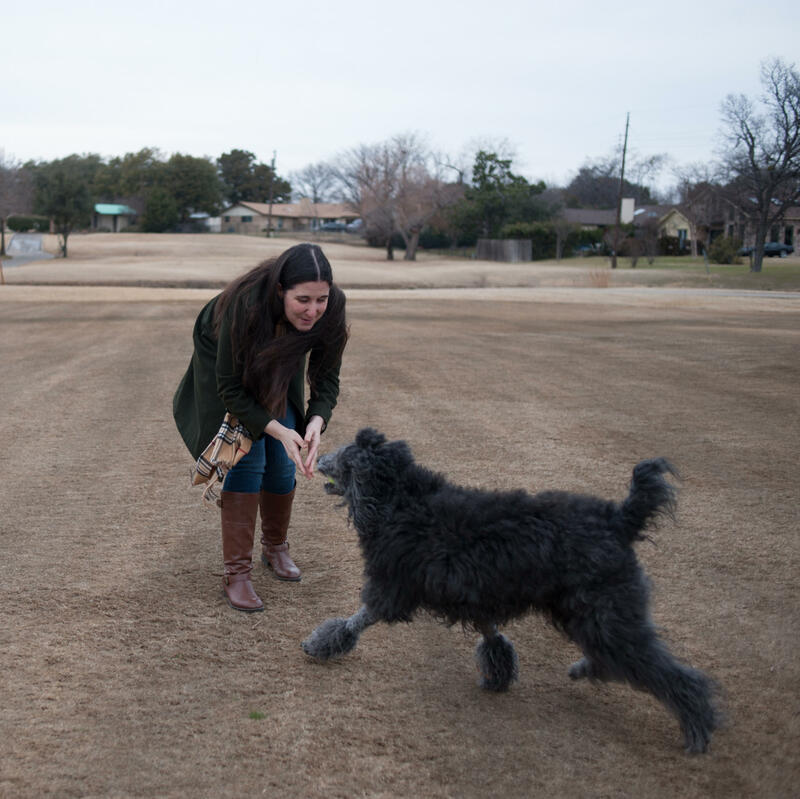 For NPR News, I'm Lauren Silverman, in Dallas. When Melissa Shenewa and her husband imagined their first weeks with their new baby, they pictured hours of cuddling. Instead, they're enduring hours of inconsolable crying. 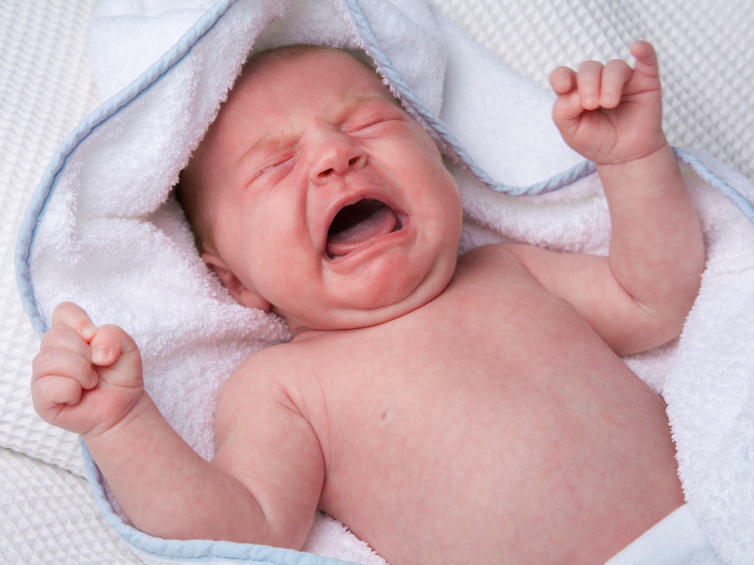 Their 6-week-old son, Aladdin, is a colicky baby. He cries for hours, usually in the middle of the night. They've tried everything they could think of. Nothing helps. "Being a parent when your child is screaming in pain for hours on end and there's nothing you can do, you feel helpless," says Shenewa, 24, who lives in Houston. "You feel like you're not a good parent." Good ideas don't only come from experts. 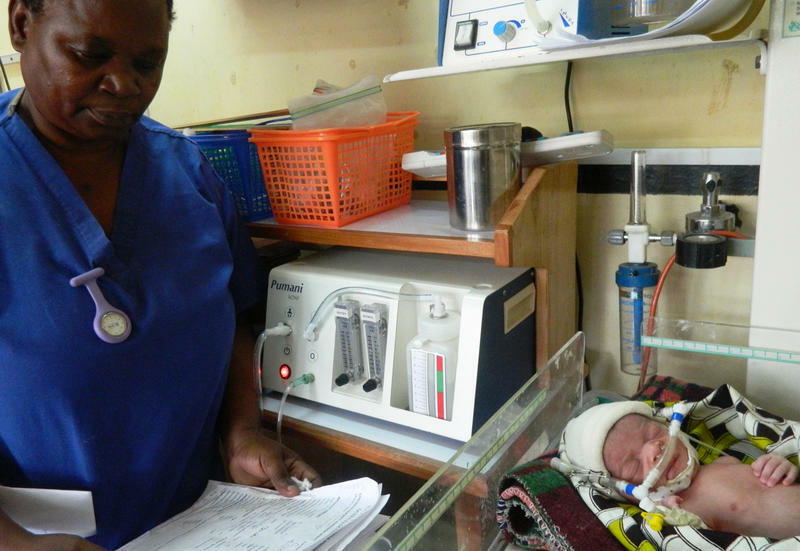 An innovative engineering program in Texas has been proving that college undergraduates can tackle — and solve — vexing health challenges in developing countries. Two engineers at Rice University in Houston are tapping the potential of bright young minds to change the world.